Previously I had written a comment piece on the recent ethical debate on use of CRISPR in Human embryo gene editing (Link). Gene editing is not a new phenomenon. Most of the gene editing to date was done using restriction nuclease and only recently have there been improved methodologies. 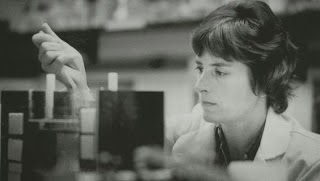 The first in the series was Zinc finger nuclease (ZFN), then came the CRISPR technology and finally the TALENs. 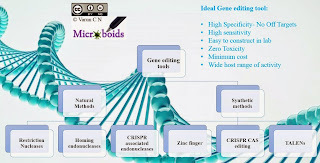 CRISPR is one of the most well known technologies in gene editing and was said method of the year 2011. The same year, TALENs also received equal recognition. However, it went less noticed. With the recent publication of "Embryo gene editing" using CRISPR, showing that it had produced many "off target effects", there is a renewed interest in TALENs which appears to have almost zero off targets. 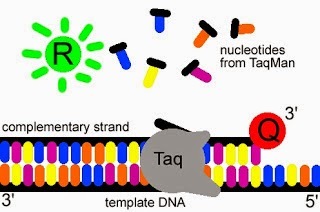 TALEN stands for Transcription activator-like effector nucleases. TALEN is derived from molecules called as TALE (Transcription activator-like effectors), to which a endonuclease enzyme is fused. TALE is produced by a plant pathogen- Xanthomonas via a type III secretion system. Xanthomonas is a member of Proteobacteria known to infect plants. upon a successful infection the TALE binds host genome and modulates its expression of variety of proteins. Structurally TALE consists of 18 repeats of 34 amino acids. The repeat varies at amino acids 12 and 13. These variation are called as RVD (Repeat Variable Diresidue). Different RVDs associate preferentially with different nucleotides, with the four most common RVDs (HD, NG, NI, and NN) accounting for each of the four nucleotides (C, T, A, and G, respectively). By fusing the TALE sequence to a Fok1 nulcease, the synthetic compound is now called a TALEN. However, Fok1 works only in a dimerized form and hence TALENs are always designed as pairs binding opposing strands of the DNA to allow dimerization of FokI in a spacer region that is bridging the two TALE binding sites. The treatment of genome with TALEN lead to specific DNA binding and subsequent DSB (Double strand break) which the genome repairs through a NHEJ or HDR. The current concerns in use of these high throughput gene editing tools is the off target effects. I'm not aware of any reports of TALEN off target effects or toxicity, the view is that not enough studies has been done to assert the claims. However, the feasibility of laboratory handling is much tough in comparison to CRISPR and hence they still are not the favorites. Let me start with an interesting question. It is now well known beyond challenge that HIV primarily infects CD4 T cells thus effecting one of the key immunological component. It also effects other immune cells but to a lesser degree. The key component of eliminating infected cell is CD8 T cells. But what gets the CD8 cells to not work, or function inefficiently. The immediate answer would be CD4 is an helper cell and effecting them leads to effects on CD8 cells. So If you could revive CD8 cell function by somehow interfering with interactions would that be helpful? The step-wise loss of cellular functionality leading to loss of the T cell is called as T cell exhaustion (TCE). T cell exhaustion was originally defined as clonal deletion of virus-specific CD8 T cells that occurs during high-grade chronic infections. Some of the well known examples of TCE include infections by HIV, Adenovirus, HBV, HCV, LCMV etc. For example In HIV infection CD8 T cells functionality drops, and begin to express markers such as Programmed death-1 (PD-1) which leads to loss of immune response capability. The exact mechanism of how a CD8 T cell is kept away from this self annihilating process is a separate post. At this time it would suffice to tell you that the CD4 is the helper via ligand interactions and secreting cytokines. 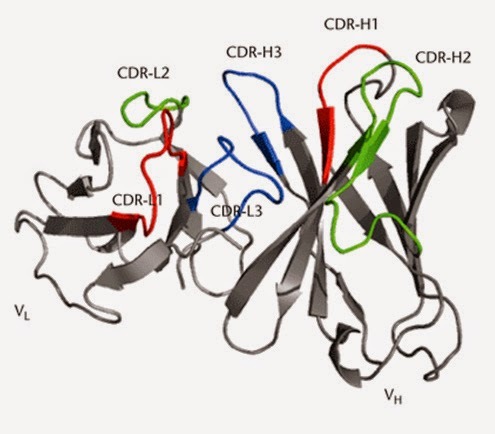 Loss of CD4 can thus effect the functionality of the CD8 T cells. Now let's think of this. If you could somehow stop the T cell exhaustion, would that in any way improve the Immune response against infections like HIV? To test this idea the ideal candidate was PD-1 for HIV. The hypothesis was that receptors like PD-1 function to inhibit T cells not only by reducing TCR signaling, but also by inducing the expression of genes that impair T cell function. With a series of experiments Porichis, was able to assert that PD-1 up regulation exhausted CD8 T cells and increase in BATF (Basic leucine zipper transcription factor) levels were seen in antigen-specific T cells with the greatest degree of dysfunction. Essentially, PD-1 blockade can enhance HIV-specific CD4 T-cell proliferation. With this understanding, tests were further conducted to see if blocking the PD-1 could be of any good. By using samples from 45 patients blocking the PD-1 pathway boosted CD4+ T-cell function, even among people who had undetectable viral load. The story gets better. The next set of study looked at at the epigenetic regulation of the gene PD-1. The study showed that in HIV-positive people with low viral loads, the promoter region of the gene remained unmethylated. CD8 TCE is a hallmark of HIV infection. This also provides a path of interest to be targeted in HIV. The complete pathway is yet to be deciphered. But several key features are known. For example, it has been shown that HIV-specific CD8+ T cells possess highly elevated levels of Eomes, CD160 and low T-bet expression. This differential expression leads to the up-regulation of several inhibitory receptors, impaired functional characteristic, which lead to TCE. Rabies is a virus that needs no special introduction, both in terms of disease and fatality. It happened so, I was into a long discussion about what really makes Rabies so deadly. Though a straightforward answer seems to be "we don't really know", there seems to be a lot of theories that I could see from the literature. Rabies is a member of Lyssavirus (Rhabdoviridae family). The genome consists of negative sense single stranded RNA, roughly 12Kbp in size. The entire structure is encapsulated into a lipid envelope with a characteristic bullet shape. The life cycle consists of entry by breach of skin. The virus is probably taken into the epithelial cells by Clathrin mediated endocytosis and subsequently reaches the muscles. It has been speculated that there probably is some rounds of replication in the muscles and then subsequently is concentrated in the neuromuscular junction. From there virus moves into the neurons and moves via the neurons to the Central Nervous system. The retrogade axonal transport is of great interest since inhibiting this step can be really useful in terms of therapeutics. 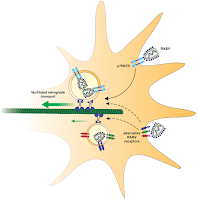 Of all the proteins produced by Rabies, G protein (glycoprotein; component of membrane spike), is essential for viral transport, as has been shown in mutation studies. Further the degree of neuroinvasion can be correlated with G protein sequences. It has been speculated that there are alternative receptors for G protein varieties, (formal proof is lacking) which may influence invasiveness. Current leading models suggest that virus moves intact inside the neurons. What happens inside the neurons with Rabies infection? For a longtime, the only thing well known fact was the Negri bodies. Negri bodies are not found in all the infected neurons. They represent sites of active viral replication. In common terms they are called as cytoplasmic inclusion bodies. The contents of Negri bodies include a variety of rabies proteins such as L, P, and N involved in viral RNA synthesis, host proteins (especially TLR3, NEDD4 and Hsp70). This is guarded heavily by N and P proteins forming a cage like structure. This protects them from degradation. Proteomic experiments have shown that there is a lot happening inside the neurons with rabies infection and most of the molecules that seems to be associated has to do with neuronal functioning. By testing for rabies antigens in whole brain through fluorescence, it is clear that Rabies mainly infects thalamus, pons and medulla. Cerebellum and hippocampus, is largely unaffected. This also explains the effect of rabies on vital functions and ultimately fatality. This also correlates with brain imaging studies. Before I get into the discussion of how rabies kills, I need to digress a little bit. Rabies is considered as a unequivocal fatal condition. Except for a very few case reports of people surviving rabies without immune treatment, it appears to be one hell of a pathogen. There is a thrust of pages online recommending Milwaukee Protocol (or also known as Wisconsin protocol), as a possible therapeutic for Rabies. The scientific community is highly skeptic of the procedure. The idea is that if you could slow down the viral axonal transport you could give enough time for immune system to take over. Immune system is able to clearly fight of the infection provided sufficient time for humoral response is given. The same is the idea in rabies vaccination post exposure. Of the 41 patients who received Milwaukee Protocol, only 6 have survived. There is no clear explanation of why. Further when there is a 100% protection with existing PEP (Post exposure Prophylaxis) why another method appears to work by chance. So the question to ask would be is Rabies really 100% fatal? Perhaps not though popular notion is that it is. For example, studies have shown Rabies neutralizing antibodies in otherwise healthy individuals though this is a small proportion. Further these may be cross reactive antibodies. These are people with risk of infection from vampire bats who are not effected by virus. The current view is that it is not 100% fatal and some may even survive without any treatment. There are other influencing factors. But mortality is indeed high. Ignoring the statistics, let us ask the question how Rabies actually kills. In other words what is the pathogenesis. 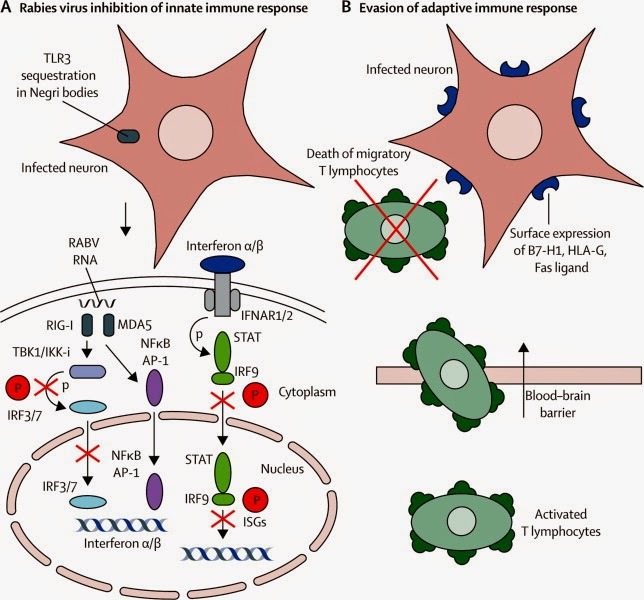 Fig 3: Rabies virus immune-evasion mechanisms. In study models using tissue culture cells (such as Macoy cell line), a variety of cytopathic effects are seen. However cytopathology depends on the cell line used and the strain of virus used. The ability to induce apoptosis has been studied and correlated with G protein. Additionally the process seems to be delayed and hence some cells maynot ever show an effect. Paradoxically, ability to inhibit the apoptosis is the hallmark of Rabies infection. This can be explained by the late production of G protein and requirement of it to reach a threshold level to trigger apoptosis very late in the cell cycle. There are different theories to explain Rabies- Neuronal dysregulation and Neuronal death. More recently the hint is that it is a combination of both, in other words neuronal dysregulation followed by Neuronal degeneration / death. An equally competing model is the excitotoxicity model. Perhaps the most worked on in recent years is the immunological model. According to Excitotoxicity model, the infection leads to neuroanl hyperactivity, cells to outstrip their energy supply and eventually die. 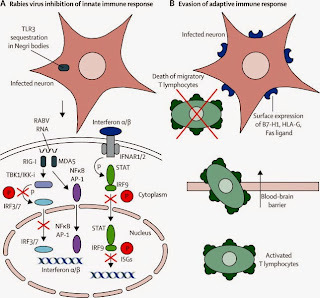 The immunological hypothesis suggests that the virus in itself is not pathogenic but the immune response triggered due to the infection, causes sever inflammation and subsequent bystander neural damage. Remember I just told you that TLR3 is there inside the Negri bodies. It has been speculated that the TLR3 sequestration probably is an evasion strategy. Also there are other strategies by which Rabies can inhibit the immune response from triggering. See Fig 3. However, it is not clear despite drastic measures by the virus to counter act immune activation, what actually triggers heavy inflammation. Interesting enough fatal encephalitic rabies is not necessarily accompanied by substantial inflammation and there is a huge variability in inflammatory response in aniaml models. 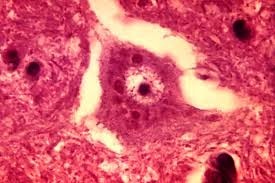 Adding to the complexity, neuronophagia can vary substantially and neuronal apoptosis does not seem to have an important role (Link) in Human rabies encephalitis. The gist of this discussion is that finally we don't know what actually happens. Every individual personnel, involved with biology as at least heard of a PCR. Though originally argued to be the brain child of K Mullis (For which he was awarded Nobel Prize), Dr Khorana at least deserves credit. And what better topic to begin blogging about Clinical Lab Science, than talk about PCR technique. PCR or polymerase chain reaction is a method for amplifying specific DNA sequences. Standard PCR involves amplification of a single DNA sequence that is less than 5 kb in length and is useful for a variety of applications, such as cycle sequencing, cloning, mutation detection etc. Long PCR is used for the amplification of a single sequence that is longer than 5 kb and up to 40 kb in length. A PCR cycle consists of three steps. 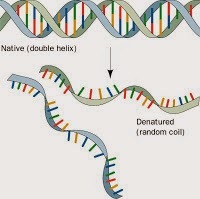 Fig 1: Denaturation of DNA. Fig 2: Hybridization of primers. The step is also known as Annealing of primers. The solution is cooled to 54-65º C to allow each primer to bind to a DNA strand. One primer hybridizes to the 3’end of the target on one strand, and the other primer hybridizes to the 3’ end on the complementary target strand. Two primers- Forward primer and the Reverse primers are used. The solution is heated to 72-75º C, the optimal temperature for Taq DNA polymerase. The polymerase elongates both primers in the direction of the target sequence because DNA synthesis is in the 5’-to-3’ direction. For obvious reasons the desired site is replicated in exact lengths from 3rd Cycle only. For a explanation check this link. These three steps constitute one cycle of the PCR amplification. The duplexes are heated to begin the second cycle, which produces four duplexes, and then the third cycle is initiated. The thermophilic DNA polymerases, like other DNA polymerases, catalyze template directed synthesis of DNA from nucleotide triphosphates. A primer having a free 3' hydroxyl is required to initiate synthesis and magnesium ion is necessary. In general, they have maximal catalytic activity at 75 to 80 C, and substantially reduced activities at lower temperatures. At 37C, Taq polymerase has only about 10% of its maximal activity. Exponential: Exact doubling of product is accumulating at every cycle (assuming 100% reaction efficiency). The reaction is very specific and precise. Linear (High Variability): The reaction components are being consumed, the reaction is slowing, and products are starting to degrade. Plateau (End-Point: Gel detection for traditional methods): The reaction has stopped, no more products are being made and if left long enough, the PCR products will begin to degrade. From the very first methods of PCR, we have now come a long way to more complicated PCR. There are a large varieties of PCR techniques available in the current market. There are several variations of PCR technique. One of the most commonly used is Real time PCR (qPCR), especially in diagnostics. There are different varieties of probe based chemistry available from various kits. The most commonly used is the TaqMan method and Molecular beacon method. Other methods that are available in market includes Molecular beacons, Hybridization probes., Eclipse probes, Scorpion probes, LUX primer, BD QZyme primers etc. Irrespective of the type of probe and primer that is used, they work on a common principle of FRET (fluorescence resonance energy transfer) or other fluorescence- quenching mechanisms, to ensure that only specific fluorescence related to amplified product is detected. Additionally, in contrast to dye based chemistry, the probe/ primer based qPCR are more specific allowing multiplex operations to performed. For the purpose of discussion and understanding, I will elaborate only on TaqMan assay. For those interested in other probes, please refer to links provided in further reading. The TaqMan probe is a sequence specific, fluorescent labelled oligonucleotide sequence. A reporter fluorescent dye (in the Fig 1 represented as R) is lined to 5' end of probe and a Quencher (in the Fig 1 represented as Q) at 3' is used. The sequence of the probe is not more than 10-12 bp and is specific for the target DNA sequence. In presence of suitable excitation wavelength the reporter fluoresce but is quenched immediately by FRET. This leads to lack of signals. At the annealing / extension step of the amplification reaction, the probe binds to specific sequence lying in between the target DNA sequence. The reaction proceeds, and nucleotides are added. When the reaction meets the probe the probe sequence is cleaved and there is separation of R and Q. The quencher is no more able to quench the signals generated and is detected by using suitable detectors. Since this chemistry uses DNA polymerase that can attack the 5' R through nuclease activity (dsDNA-specific 5'—>3' exonuclease activity), the technique is also known as 5'- nuclease method. Let me talk about one more of technique of great interest- Eclipse probe. The probe is similar to TaqMan with a quencher and Reporter but has an additional site called as MGB (Minor groove binder). In unbound conditions probe adopts a conformation that brings the reporter and quencher together, quenching the reporter. During amplification, probe hybridizes to the target with the help of the minor groove binder. This provides additional specificity. This leads to changes in the probe alignment and converts to linearized form, separating the reporter and quencher and allowing the reporter to fluoresce. This is detected as a emission signal. Dye based chemistry is a much more older method. The method uses a fluoerescing chemical that can bind to DNA (Inter-calating agent). As the DNA multiplies, there is more dsDNA. This can be detected by using the dye which binds dsDNA. The method carries the advantage of not having to design a specific probe, but comes at cost of specificity (Binds any dsDNA) and mulitplexing is not an option here. Almost universally, the preferred dye is SYBR Green I. SYBR Green I is an asymmetrical cyanine dye used as a nucleic acid stain. The resulting DNA-dye-complex absorbs blue light and emits green light. But its not the only dye that is available. Dyes such as SYTO9, SYTO-82 and SYTO-13 have similar properties as that of SYBR. All these dyes do not inhibit PCR, but show a preferential binding to GC-rich regions and influence melting temperature. This has important applications in melt curve analysis. More recently a large variety of dyes have been developed that has outperformed the SYBR class of dye. Of all, a dye- EvaGreen has shown great promise. Multiple studies show it has higher stability and better compliance than that of SYBR class of dyes. Moreover, the absorption and emission spectra of EvaGreen are very much similar to that of SYBR Green I.
PCR is just one of the methods to amplify DNA. The drawback of this method is the requirement of specialized equipment. This reduces its applicability in the field. Over the years isolathermal methods have slowly gained popularity in DNA amplification especially for field work settings. As an example of it, let us look at LAMP assay. Fig 8: Some commonly used techniques in nucleic acid amplification. 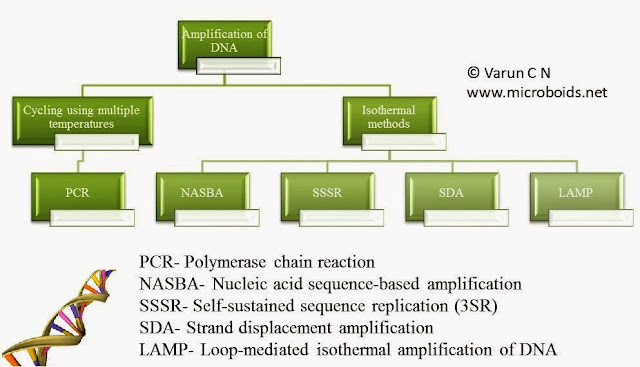 Loop mediated isothermal amplification (LAMP) is an alternative for PCR, used to amplify the DNA. In contrast to PCR, this doesn't require a thermal cycler. The process of genome amplification is done at a uniform temperature. Hence the terminology- isothermal amplification. During the reaction a loop based structure is produced, hence referred as Loop mediated. The method was first developed by Eiken Chemical Co., Ltd in 1998 and first peer reviewed publication was described by Tsugunori Notomi and group. The original method utilizes a DNA polymerase and a set of four specially designed primers that recognize a total of six distinct sequences on the target DNA. The LAMP uses 4 primers- Two forward primers: Forward Inner Primer (FIP), Forward Outer Primer (FOP) and 2 backward primers: Backward Inner Primer (BIP), Backward Outer Primer (BOP). The first step of amplification is to make single stranded DNA from double stranded DNA. This is accomplished in PCR by heating. The same is achieved in LAMP by using Bst polymerase which can displace the dsDNA efficiently at temperatures less than 65 C. Bst is derived from Bacillus stearothermophilus and contains the 5´ → 3´ polymerase activity. Its activity diminishes at temperatures higher than 65 C. Bst 2.0 DNA Polymerase is an in silico designed homologue of Bacillus stearothermophilus DNA Polymerase I, with improved properties in comparison to the earlier type. Both types are tolerant various inhibitors usually associated with diagnostic specimens. This serves as an advantage over the PCR Taq polymerases. The LAMP reaction is started by adding the Bst polymerase, which opens the DNA and allows primer to be hybridized. Further the polymerase, simultaneously synthesizes the other DNA strand. In the process a stem loop is formed which automatically primes the next round of reaction. A fantastic step by step explanation of how exactly this happens, is given here. Since all steps are combined into a single step which automatically can cycle by itself, the need to heat cycling the reaction is avoided. The technique comes with an added advantage. By virtue of multiple primer being used, the reaction is more specific with better product yield in comparison to PCR. To state in nutshell, the reaction takes place in a single tube containing appropriate buffer, extracted target DNA, Bst polymerase and 4 primers. The tube is incubated at 64°C. The reaction can be detected easily by addition of DNA intercalating agent such as SYBR green. Photo 1: Visual detection of LAMP product under UV light. In current technology, the detection is improvised by using a calcein system. It is known that the DNA replication process yields pyrophosphate ions as a by-product from the substrate dNTPs. The calcein in the reaction mixture initially combines with manganous ion (Mn2+) so as to remain quenched. As the amplification proceeds, manganous ion is deprived of calcein by the generated pyrophosphate ion (P2O74-) resulting in fluorescence. The free calcein is can now combine with magnesium ions in the reaction mixture resulting in stronger emission. The LAMP testing method can also be used for detection of RNA, by using a additional step of reverse transcription. The obvious advantages are that its a isothermal procedure and doesn' require any additional consumables or equipments. LAMP method has already gained popularity in detection of pathogens. It is of considerable importance in TB field testing. I want to end with an additional note here. Other than the the common isothermal methods that I mentioned earlier, there are a few more that am aware of but hasn't gained much popularity. That includes- Nicking enzyme amplification reaction (NEAR), Helicase- dependent amplification (HDA), Recombinase polymerase amplification (RPA) etc. Antigen- Antibody reaction forms the basis for most the laboratory workup methods, in the current scenario. Reactions come by several methodologies and are named accordingly. However, they all are built on the same basic rules and principles of reaction. In this post, we will explore a little bit of the basics ad talk about ELISA as a best classic example of Ag-Ab reaction. There are 7 rules that defines all Antigen-Antibody reactions. Take any Antigen-Antibody reaction and the principle would belong to combination of rules laid below. 1. The reaction is specific, an antigen combining only with its homologous antibody and vice versa. The specificity, however, is not absolute and cross reactions may occur due to antigenic similarity or relatedness. The phenomenon was known as cross re-activity. 2. Entire molecules react and not fragment. When an antigenic determinants present in a large molecule or on a carrier particle reacts with its antibody, whole molecules or particles are agglutinated. 3. There is no denaturation of the antigen or the antibody during the reaction. 4. The combination occurs at the surface. Therefore, it is the surface antigens that are immunologically relevant. Antibodies to the surface antigens of infectious agents are generally protective. 5. The combination is firm but reversible. The firmness of the union is influenced by the affinity and avidity of the reaction. 6. Both antigen and antibodies participate in the formation of agglutinates or precipitates. 7. Antigens and antibodies can combine in varying proportions, unlike chemicals with fixed valencies. The above reaction is reversible depending on how good is the Ag-Ab reaction. I mean to say, how well the antigen binds to antibody. From a chemical perspective of reaction, it can be expressed as shown in the equation to the left. In the equation. Keq is called the equilibrium constant and is equal to the ratio between the association (ka) and the dissociation (kd) rate constants. of Ag-Ab reaction. Adapted from Reverberi etal. A given Ag-Ab reaction depends on other factors of interest also. This is shown in Table 1. A set of chemical bonding is responsible for the stability of Antigen (Ag) and Antibody (Ab) bonding. The list includes- Hydrogen bonds, hydrophobic bonds, Van der waals and electrostatic interactions. That explains much of the basics of antigen antibody reaction. Often the question that merits a good length of discussion in this context, is how the antibody recognizes the antigen so well and at such an incredible efficiency? The answer lies in charge. The theory says that the epitope displays a charge configuration on its surface which can be counter matched by charge configuration in the hyper-variable loop (CDR; Complementarity determining region). Immediately the question is raised what about the cross reaction? Consider 2 antibodies that fit onto an eptiope well. 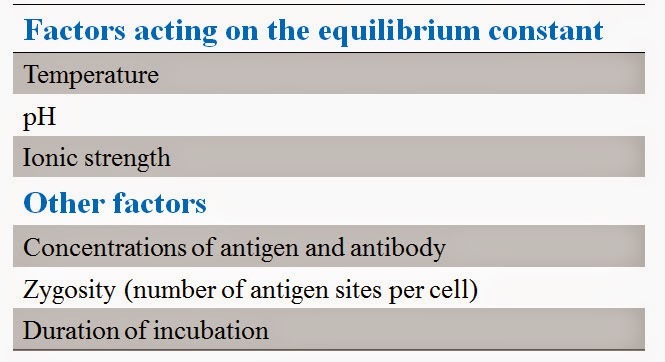 Suppose for argument sake there is an antigen and 2 antibodies (See Fig 3, shown below. Only the binding area is represented as linear diagram to simplify understanding). The antibody 1 (Ab1; represented by green color) is absolutely complementary to Ag and can thus bind perfect. But Antibody 2 (Ab2; represented by blue color) also has almost a good complementation except for terminal part, where the charge is + on both Ag and Ab2. As you know, like charges repel and opposite charges attract. Since the force of attraction is more here, the Ab2 binds and hence represents a cross reactive antibody. In the equation B represents binding, A represents affinity and R is Repulsion. In Fig 3, there are a total of 7 points of interaction. Of theses 6 points of interaction represents "Affinity" and 1 point represents "Repulsion". So the equation dictates that B= 62- 14 which is a positive value. If the value is positive it means the binding would happen. If the equation yields Zero or negative value then the reaction wouldn't happen. That means, if there would be a discrepancy in 3 points in the above said reaction then the equation looks B= 42- 34 which is negative value. Oh yes, this is a total oversimplification as there are several points of interaction but serves the theoretical point of understanding. My point is, the total number of points interacting and how it interacts has the final say. Last point, higher the negative value obtained (from above equation), higher is the repulsion. Higher the positive value obtained better is the binding. So if there is very small positive value the binding kinetics would still be poor. There are several sets of antigen-antibody reaction such as agglutination, precipitation, ELISA, CLIA, Blot assays etc. Let us take ELISA as an example to talk about. ELISA stands for Enzyme linked immunosorbent assay. The methodology was first described in 1971 by Engvall and Perlmann. The method seemed to so useful and convincing, almost any substance that can be antigenic and any antibody could be detected or even quantified with little tricks. The method ruled the field of wet lab science for almost 3 decades now and still continues to be so. Though many of the tests are now modified towards Chemiluminesence Immunoassay (CLIA), in most of the parts of the world, ELISA dominates. So what is this ELISA? The technique is a sub type of more broader group called as EIA (Enzyme immuno-assays). The ELISA technique uses a solid phase to immobilize the Ag-Ab complex and hence the name. Antigen and antibody specificity is used as the basis for the reaction. The reaction is signaled by the use of enzyme as marker, that can convert a substrate into colored compounds. There are a wide array of solid phase that can be used for ELISA. The solid phase used can be classified into high capacity (Agarose, Sephadex, Cellulose, Nitrocellulose etc) and Low capacity types (Polystyrene, Polyvinyl chloride, Nylon, Glass). The capacity of solid phase can be manipulated as demanded by the assay. For instance, Cyanogen-Bromide activated Sephadex is a high capacity solid phase that has established binding with a wide range of proteins. It can be used in detection of IgE antibodies even when coated with impure antigen preparation. The most commonly used solid phase in current settings is the microtitre plates usually made of Polystyrene. ELISA microtiter plates are manufactured in 3 steps. Coating the plate with a stabilizer to allow dry storage of the plates for long periods of time. A microwell or microtitre plate typically consists of 6, 24, 96, 384 or more sample wells arranged in a 2:3 rectangular format. Most common laboratory microwell, is designed for working with nearly 0.5 ml of reactions. The antigen / antibody binding to plate is mainly dependent on the temperature and duration. The most common method for coating plates involves adding a 5 +/- 3 μg/ml solution of protein dissolved in an alkaline buffer such as phosphate-buffered saline (pH 7.4) or carbonate-bicarbonate buffer (pH 9.4) at 4C for overnight. The binding can be increased by use of agents such as Gluteraldehyde or carbodiamide. For binding of high carbohydrate containing molecules Poly-L-lysine has been used. Modern industrial standards use more complicated chemistry to achieve higher quality. Plastic solid phases have an affinity to bind variety of proteins and can lead to increase in non specific reactions. This leads to background noise. This can be reduced (not eliminated), by blocking non specific sites on the plate. Many different stabilizers are available at the manufacturer's disposal. Most of them are patented synthetic formulations that preserves the plate form drying. The second most important reagent for ELISA is a conjugate. This is a marker antibody, that has got Enzyme on its Fc portion. Recall from the structure of antibody that the Fab portion is involved in binding the antigen and the Fc is free. The primary question here is how do you link the Enzyme to Fc tail of an antibody. The trick is to use linkers. Two broad range of linkers are available. Homolinker and Heterolinker. The type of linker to be used depends on the enzyme and antibody to be linked. Adipic Acid Dihydrazide, Glutaraldehyde, Periodate, N-succinimidyl 3-(2-pyridyldithio) propionate (SPDP) etc are used as linker for HRP. HRP (Horse Raddish Peroxidase) is a commonly used enzyme. Other choice of enzymes used include Alkaline Phosphatase, Acid Phosphatase, etc. Reactions using peroxidase enzymes (such as HRP), on TMB substrate produces a soluble blue product. The color fades in short time. If intended to keep for longer duration with color preserved (especially in techniques such as Cell ELISA) ammonium heptamolybdate, Osmium tetroxide or nitroferricyanide can be added to stabilize the TMB chromophore. In indirect ELISA, antibody to be detected is added to well containing coated antigen. If antibody of interest binds specifically, the antibody immobilizes via antigen to the solid surface. A second antibody conjugate that recognizes the Fc portion is added. If there is a stable immobilized Ag-Ab-Ab complex, the enzyme will be available for reaction after the washing step. The substrate will be converted to colored product. Finally the reaction is stopped using a stop solution. The final color is read by using a ELISA reader. Indirect ELISA is the method of choice to detect the presence of serum antibodies, such as HIV antibody. In the sandwich technique, Antibody is immobilized to the well. The antigen in test, is allowed to bind. A second antibody (Conjugate), that binds to the Antigen-Antibody complex is used as marker/tracer. The stable, immobilized Ab-Ag-Ab will contain the enzyme to convert substrate as in Indirect technique. Sandwich technique is used to demonstrate antigens such as HBsAg in serum. Theoretically, the technique of ELISA gives a higher sensitivity, as the enzyme can convert more substrates to colored product, provided the reaction can be allowed to proceed for a longer time. However, too much of incubation may enhance noise to signal ratio.